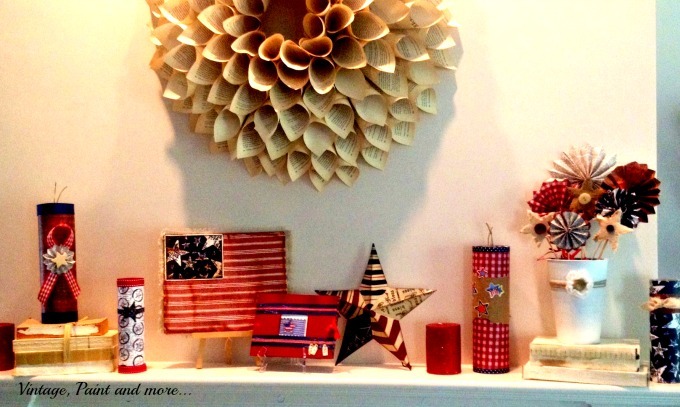 Today I am going to show you some of our July 4th decor. 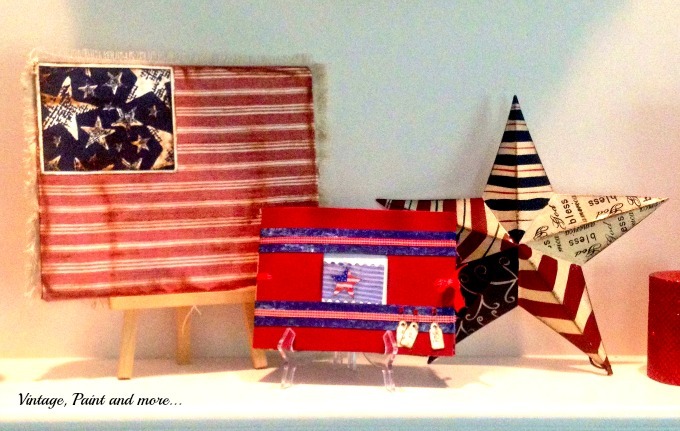 I don't decorate very much for the 4th...We are usually traveling or so very busy I don't have the time. But, this year I decided to do the mantle and the entryway. This is the mantle. The pictures are a little dark - well, OK a lot dark but; it has been raining and raining and raining for days now. Our living room is quite dark and with all the lights on the pictures are still dark. I kept the mantle simple and created everything with objects I had on hand. Starting on the left you will find a glittery candle from Dollar Tree left over from Christmas. 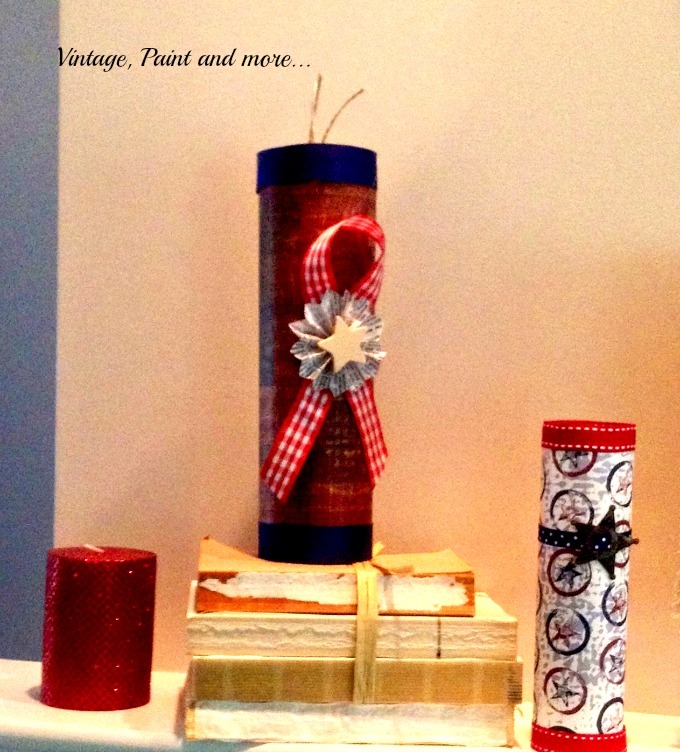 I placed a faux firecracker made from a Pringle's can on a stack of old books - sans covers and tied with raffia. 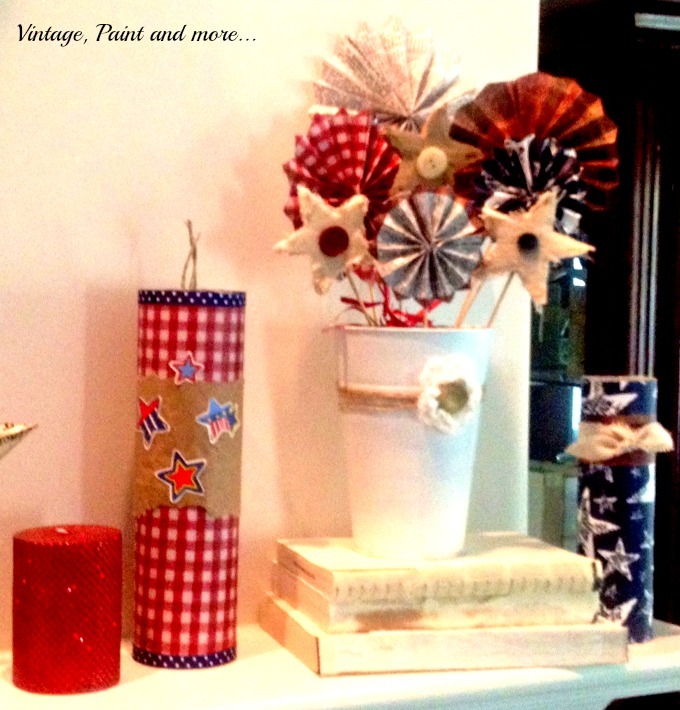 The Pringle's cans were wrapped with patriotic scrapbook paper and then decorated with scrapbook embellishments I had. I also wrapped a prayer candle from Dollar Tree with scrapbook paper and added a ribbon and tin star. These are quite easy to make and turn out so cute. 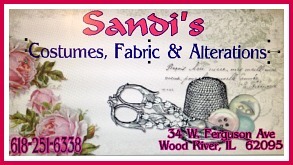 Next you will find a flag made with card stock and scrapbook paper then backed with raveled burlap. I love the vintage feel and look it gives to the mantel. The little red book is a 4th of July scrapbook I made several years ago. Lastly, a star from Hobby Lobby my son brought me. On the right side of the mantel is another glittery Dollar Tree candle and another decorated Pringle's can. I painted a metal bucket from Dollar Tree with DIY white chalk paint and filled it with small pinwheels I made from scrapbook paper and book pages and glued to small skewers. There are also three styro foam stars that have been covered with burlap and buttons glued on to give them that vintage look. Then lastly, I places another decorated prayer candle. 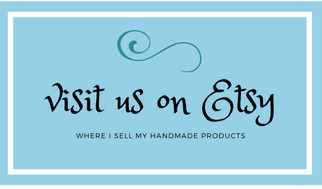 ( I found those little stars at a garage sale a long time ago and haven't seen any since. So, that is our very simple mantel. Everything is made from things about the house or I picked up at the Dollar Tree. And, to top it off is our resident book page wreath which lends to the whole vintage feel also. 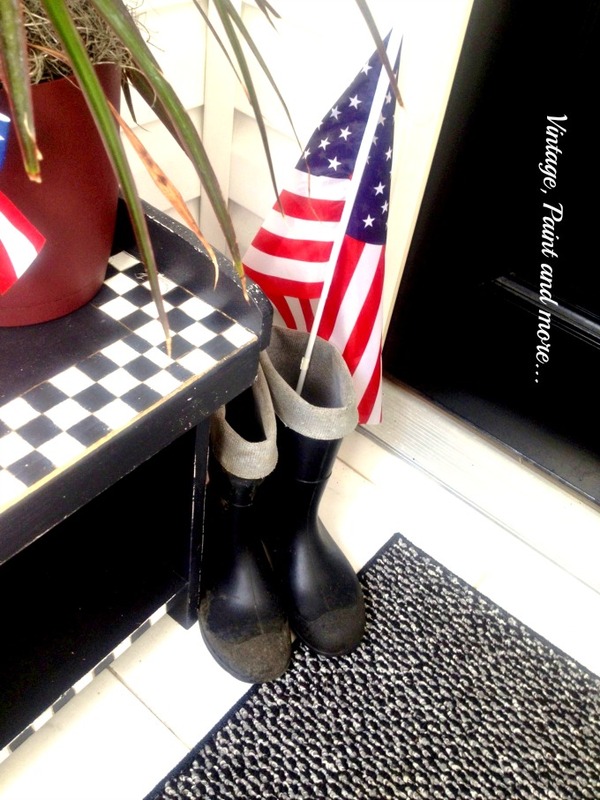 I also kept the entryway very simple with just a few touches of red, white and blue. 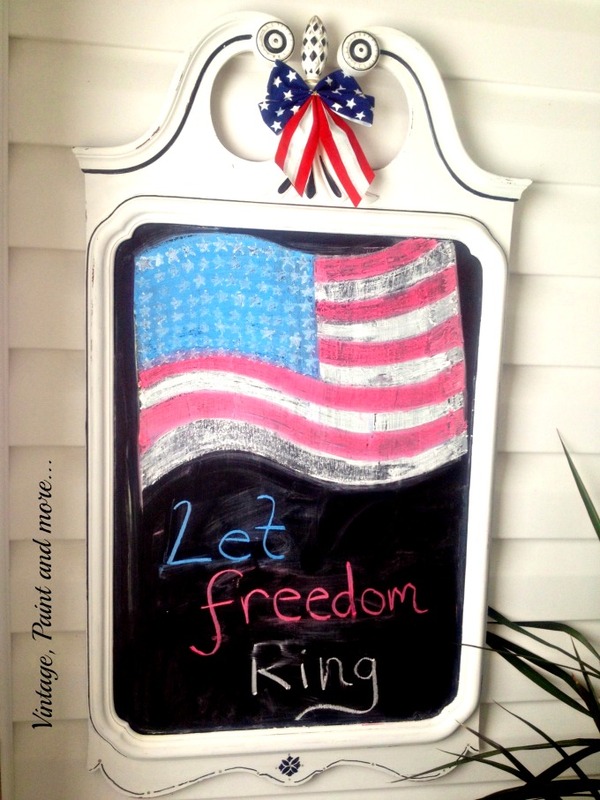 My granddaughter drew a flag on the new chalkboard then we added a red,white and blue ribbon from Dollar Tree to it. I found a pair of old black fireman boots at a thrift shop for $2. We added a Dollar Store flag to them. I love them parked next to the bench - they tell a story all their own. 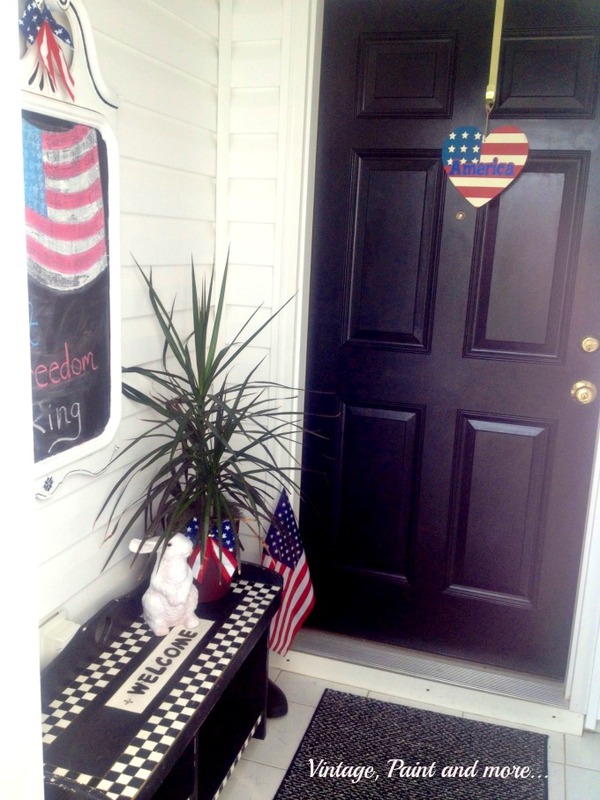 The plant got a red, white and blue bow and the door got a heart all decked out for the forth. ( The heart was found at Dollar Tree also) Just a few touches to brighten the entryway for the holidays. We are celebrating our 4th at the beach (if the weather cooperates) with a picnic, fun in the waves andfireworks with our grandkids. How are you planning to spend yours?